The Glory of Sandwiches & Invasions & Whistles. So, if you are word averse, or just feeling kind of tired and need a visual representation, there is an illustration within the text today so you can skip to that and decide how epic on a scale of one to Avengers Assemble it is! Yes you can! You are very welcome. However! If you are up for some words here is the deal: Amalia Dillin is hosting a nice little giveaway on her blog in which ALL YOU HAVE TO DO, I mean completely and utterly, is either post a picture of a sandwich or write about one. How simple! I cannot think of a better way to spend time! It closes today at 9pm EDT, forever away I am sure you will agree! Anyway, that is that. I am not really entering for the prizes (including possibly one half naked Thor) due to geographical limitations HOWEVER I thought I'd have fun with something that happened recently and it involved sandwiches and, as ever, is entirely factual. It is a short tale; the most fantastical things always seem to last but a moment. When I said I'd take the zombies out to lunch I had no idea they meant let's go out to lunch, and invade a local deli, cover the floor glitter, eat all the fixtures, and maybe even scare an unsuspecting cashier under the counter. Even though the glitter thing is almost always implied, I wasn't really listening when they proposed it; I confused their ominous ARGHUGLE with an innocent AGURRRGLE which is, as an enthusiast will tell you, a total rooky mistake. Standing by the sauce stand, leaning a hand in what I hope is a light smearing of ketchup, I blow my zombie whistle. The feather pasting halts, bread is hastily spat out, and the room pauses as I say, "Now, who would like to tell me what happened to the other cashier with the hat?" I'm not sure why I even ask; as soon as they latched groans on the glorious brim of her sandwich inspired ensemble I think I knew she wasn't going to last. Dressing up like food and then asking zombies to understand why you are not actually wanting to be placed with food is a risky thing to do indeed. I sigh, and lean against the counter, letting the cool (hopefully) ketchup seep into my shirt as I am passed a something. The tower wobbles as I balance the plate; the undead take the phrase choose your own filling very seriously and oh how they have chosen. 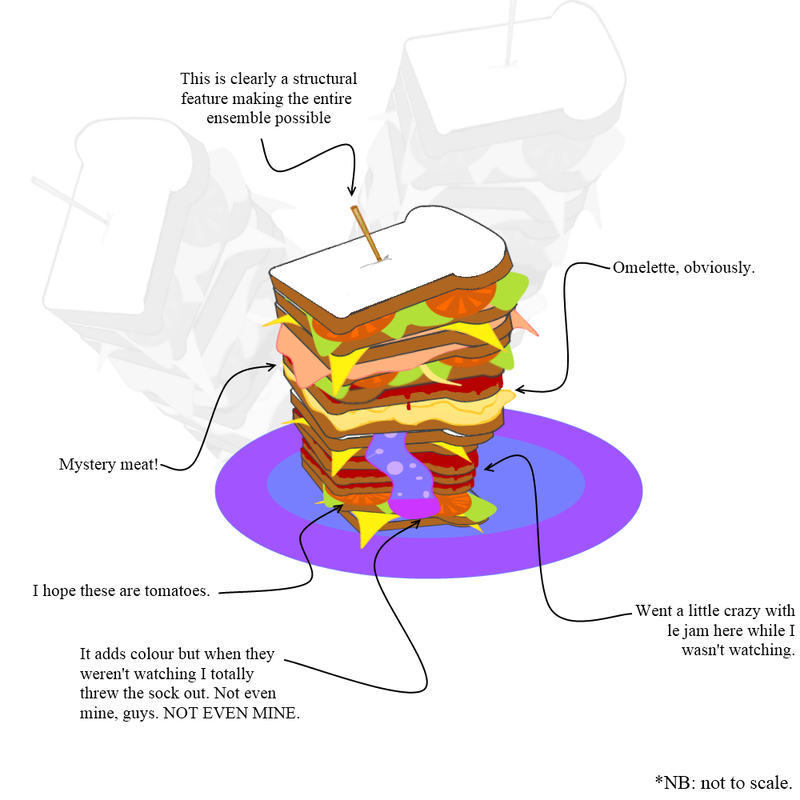 The sandwich is an architectural gem. It's glorious. It balances with the grace of a dancer as I consider it. "You-you b-b-better eat it," a small voice calls from the counter. I look up to find a hat and two wide eyes peering at me. "I stopped looking after they took Janelle's sock... I'm not even sure that sandwich is legal right now... Somebody has to try that sandwich." Now! For those of a nervous disposition do not fear! I totally located Janelle at a later point sans a sock but un-sans everything else! Woo! How fortuitous! So! Have you eaten any cool sandwiches recently? Approve of the one I was made? How would you rate this sandwich on a scale of one to HOLY BATMAN AWESOME? Aesir Legal; Lady Justice & chocolate box ribbons & Animorphs. Aesir Legal; last friday night & keys & crumpet stealing.